Human Givens Blog: “I’ve got this pain …” - a human givens perspective on how GPs can help patients with medically unexplained symptoms. “I’ve got this pain …” - a human givens perspective on how GPs can help patients with medically unexplained symptoms. There are many times, as a doctor, when I need to hang up my stethoscope. This is an undesirable state of affairs that could so easily be avoided. How it comes about is as follows. Patients feel angry and rejected if told nothing is wrong, when clearly something is wrong. Unless, within the context of the NHS, we develop a plan that allows such people to receive due attention and understanding, they will become, in the derogatory term used by doctors, ‘heart sink’ patients. Symptoms may become exacerbated and rate of referral into secondary care is increased. How do we break out of that cycle? 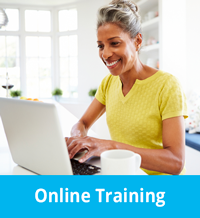 The teaching in the workshops that I conduct shows general practitioners how they can develop a different understanding of these patients and explain, in a way that satisfies patients, the very real symptoms that are being experienced. People’s state of health relates directly to what is going on in their lives, particularly, as is so clearly taught in the human givens approach, to their responses to the predicaments they face. What happens to us in such situations can be clearly understood in physiological terms, which, I find, appeals both to GPs and to patients. The body, in adapting to evolutionary challenges, has developed an array of responses that maintain the constancy of its internal state and resist harmful imbalances. A thirst reaction protects us from dehydration, for instance. Tiredness and fatigue are responses that serve to warn us to stop before we become exhausted. However, the ever-changing pressures in our complex lives can lead us to ignore or overrule these sensations. 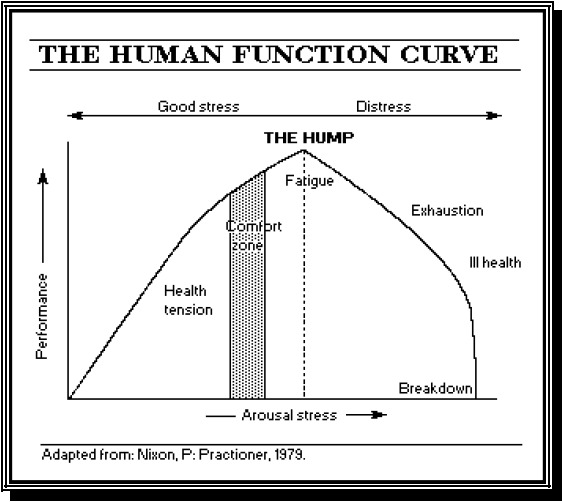 To explain the difference between healthy arousal and exhausted over-arousal, cardiologist Peter Nixon developed ‘the human function curve’,9 a continuum drawn as an inverted U on a graph. Healthy functioning and healthy fatigue, on the up slope of the curve, are experienced when we are coping well, adapting to changes in our lives or making supreme efforts that have successful outcomes. Exhaustion and ill health on the down slope, often followed by breakdown, occur when we are not coping and adapting effectively and we feel defeated, no matter what efforts we make to deal with the demands in our lives. Too much sustained, unhealthy, down slope arousal leads to the loss of internal balance and results in reduced performance and a mind–body system in overdrive. In this state, the metabolism is struggling and cholesterol, blood sugar and blood pressure are often raised, resulting in ill health. As a GP, I can actually show someone that they are stuck in sustained arousal, with over breathing and changes in body chemistry occurring as a result. 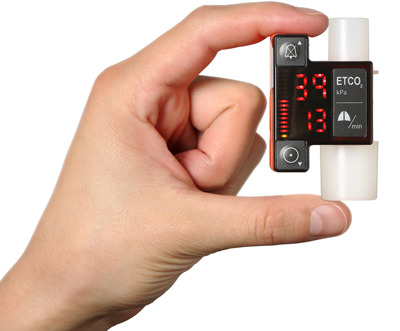 To do this, I measure breathing chemistry, using a capnometer, a light, non-invasive nasal probe that measures carbon dioxide levels in the out-breath. Most people think that, the more they breathe, the more oxygen is available in the system. In fact, with normal lungs, the reverse is the case. Over breathing results in reduced carbon dioxide availability to all parts of the body, and reduced oxygen is the result. For each millimetre drop in carbon dioxide that can occur in one breath, there is a two per cent reduction in available oxygen. I take measurements first when patients are at rest and then after asking them to recall a situation that makes them anxious, as described in the ‘think test’.11 Patients can view the outcome for themselves on a screen, as we do the tests. Such measuring devices are available to GPs, although probably a minority have them. They can be particularly useful if a patient is stuck on a need for disease status. Sometimes, unfortunately, doctors, the press, employers, insurance companies and the pharmaceutical industry, as well as the health service, have a need to label unexplained and functional syndromes as if they had a simple aetiology. Perhaps this is inevitable in a market economy, which then creates a product to ‘solve’ complex problems that actually need to be solved within the framework of human needs. A virus becomes the cause of chronic fatigue syndrome, rather than a final de-stabiliser when immune function is already compromised. Fibromyalgia becomes a condition, rather than the consequence of too much sustained pressure, and so on. Nutrition is very important in this respect. As mentioned, an over-pressured state of internal arousal results in raised cholesterol, raised blood sugar, raised cortisol levels and disturbed immune function. In such a state, the individual is likely not to have paid attention to good nutrition, and may often have tried to drive a malfunctioning and exhausted mind and body with the help of excessive alcohol, comfort foods or stimulants. Choices that restore good nutrition, initially supported by supplementation, including re-balancing neuronal circuitry with omega-three fatty acids and micronutrients, are often useful supportive adjuncts. If, according to their own account, someone’s energy is well on the down slope of the human function curve, it is often advisable, if it is possible, to withdraw from the situation in which the symptoms arose to a place where recovery can occur. Patients are always interested to learn that, in Ancient Greece, over-pressured patricians withdrew into healing temples, where they were allowed rest, sleep and recovery. Body work, including massage, hot baths combined with music and a calming environment, made up the initial first stage of healing. Only later were exercise, reflection and reasoning encouraged, followed by a return home. The common man (plebeian), on the other hand, just received medicines! I think the role of the GP is to see the person as a whole, and establish whether pathology is or is not present. But the answer doesn’t have to affect the approach that is consequently taken. Recovery of wellbeing, whether with pathology or when so-called ‘unexplained’ or ‘functional’ symptoms are present, requires that internal systems return to homeostatic balance, where internal self-regulation is restored once more. Scientific study of meditation, which underpins many ancient health care approaches, particularly in the East, has at last rediscovered the value of slowed breathing. Four randomised controlled trials, using a biofeedback device called a RESPeRATE,15 have shown that breathing exercises that slow the breath to about six breaths per minute, with a prolonged out-breath, significantly reduce blood pressure in those with hypertension – the reduction is equivalent in effect to two antihypertensive drugs taken regularly. Just 10 minutes of such exercises four times a week are enough to achieve this effect. How much more effective would it be if prescription of such a regime could be combined with the human givens emphasis on identifying people’s unmet needs and misused innate resources, and working to help them make positive change? The problem for many people, however, is that, when on the down slope of the human function curve and in a state of struggle, both external and internal, they cannot take charge. A skilled facilitator is required to help them re-engage the observing self – the rational part of us that can see the bigger picture. Once such a mutual understanding is reached, this is when effective counsellors and social prescribers have a role in the GP surgery. With such help, individuals can rediscover their strengths and learn to apply appropriate choices to their life-style and relationships. 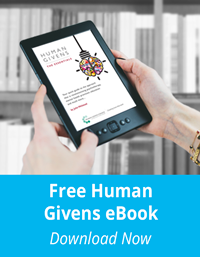 This will include nutrition, exercise and all the methods inherent in the human givens approach, where strengths and resources are remembered or reframed. Our human needs return to centre stage. Dr David Beales is a practising physician, educator and researcher. After first specialising in rheumatology, he chose to become a GP, working in inner London and then, for the next 26 years, in Cirencester. He was a research practitioner for the South West region and spent a year as the GP member of the Clinical Standards Advisory Agency. He left the NHS in 2000 and became chief medical officer to the Bristol Cancer Help Centre. He lectures on the whole person course for medical students at the University of Bristol and facilitates workshops for GPs on holistic medicine. He is also a research associate at the University College of Buckinghamshire and Chilterns, working on breathing pattern disorders and asthma. He is medical director for Better Physiology. This article originally appeared in Vol 11, No 4 2004 of the Human Givens Journal. 1. Wessely, S, Nimnuan, C and Sharpe, M (1999). Functional somatic syndromes: one or many? Lancet, 354, 936–39. 2. Burton, C (2003). Beyond somatisation. British Journal of General Practice, 53, 233–241. 3. Olde Hartman, T, Lucassen, P, van de Lisdonk, E, Bor, H and van Weel, C (2004). Chronic functional somatic symptoms: a single syndrome? British Journal of General Practice, 54, 922–927. 4. Kroenke, K, Price, R K (1993). Symptoms in the community. Prevalence, classification, and psychiatric co-morbidity. Archives of Internal Medicine, 153, 2474–80. 5. Dowrick, C, Ring, A, Humphris, G, Salmon, P (2004). Normalisation of unexplained symptoms by general practitioners: a functional typology. British Journal of General Practice, 54, 165–70. 6. Beale, N and Nethercott, S (1986). Job loss and health. British Journal of General Practice, 36, 261–4. 7. Pert, C B, Ruff, M R, Weber, R J and Herkenham, M (1985). Neuropeptides and their receptors: a psychosomatic network. Journal of Immunology, 135, 820–826. 9. Bullock, A and Trombley, S (1999). The New Fontana Dictionary of Modern Thought (Nixon, P, 404–405). HarperCollins. 10. Chaitow, L, Bradley, D and Gilbert, C (2002). Multidisciplinary approaches to breathing pattern disorders. Churchill Livingstone. 11. Nixon, P and Freeman, L (1988). The ‘think test’: a further technique to elicit hyperventilation. Journal of the Royal Society of Medicine, 81, 277–9. 12. Kleiger, R and Miller, J (1978). Decreased heart rate variability and its association with increased mortality after acute myocardial infarction. American Journal of Cardiology, 59, 256–262. 13. Stone, J et al (2002). What should we say to patients with symptoms unexplained by disease? The ‘number needed to offend’. BMJ, 325, 1449–50. 14. Griffin, J and Tyrrell, I (2003). 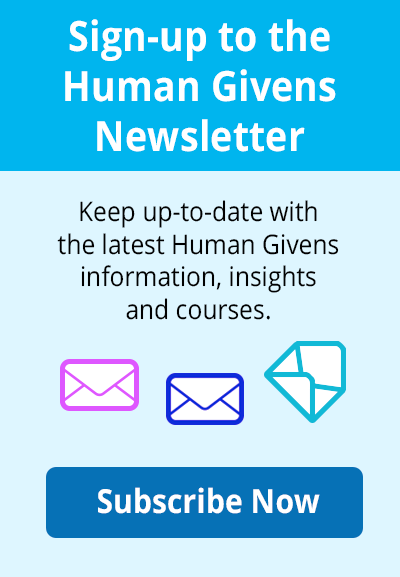 Human Givens: a new approach to emotional health and clear thinking. Human Givens Publishing Ltd.
15. Grossman, E, Grossman, A, Schein, M, Zimlichman, R and Gavish, B (2001). Breathing control lowers blood pressure. Journal of Human Hypertension, 15, 4, 263–9. 16. Le Shan, L (1978). Cancer as a turning point. 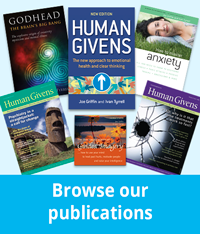 Gateway Publications. 17. Beales, D (2004). Beyond mind–body dualism: implications for patient care. Journal of Holistic Health Care, 1, 3, 15–22.